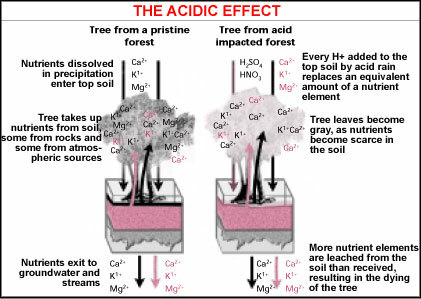 acid rain leaches essential metal nutrients such as potassium, calcium and magnesium from the top soil, posing a far graver threat to forests than previously estimated. This was discovered by Martin Kennedy, a scientist at the us-based University of California, and his colleagues. The researchers experimented on trees in the unpolluted forests of southern Chile. "We went to the cleanest atmosphere on Earth so that we could find the closest thing to a long-term sustainable forest," Kennedy said. "There, we sampled soils, stream water, rain and plants, and analysed the strontium isotope composition of each one." Strontium isotopes indicate very accurately which fraction of nutrient comes from rain and which fraction comes from the rock. "We found that in the dominant tree species -- the southern beech -- approximately 90 per cent of the strontium, and other similar nutrient elements were brought in by the rain and did not come from soil or rocks, as just about everyone had assumed," said Kennedy. The researchers also applied a distinctive artificial chemical tracer to the soil in a small portion of the forest. The tracer mimics the natural nutrients in the soil and trees with the advantage that it can be measured and observed as it moves throughout the soil-plant system. By sampling the tree parts and soil over a period of time, and by analysing the samples of the tracer, the scientists found that within three years most of the tracer was quickly leached from the top soil. The loss of this element within such a short amount of time surprised the researchers because it implies that a far smaller pool of nutrients is available to the trees from the upper soil than they had imagined. The researchers say that the small size of the upper nutrient pool has important implications for forests influenced by industries. "Our study not only challenges the dominant paradigm that rocks and soil mineral weathering provide a majority of some important plant nutrients," said Kennedy, "but it also proposes that acid rain is a much bigger problem, potentially, than we had ever imagined."